Some of my fondest memories of London are having afternoon tea. What better way to while away a few hours than dainty sandwiches, delicate cakes and warm scones with jam. I love afternoon teas but having had quite my fair share, one thing for sure is that they most definitely are not all equal. 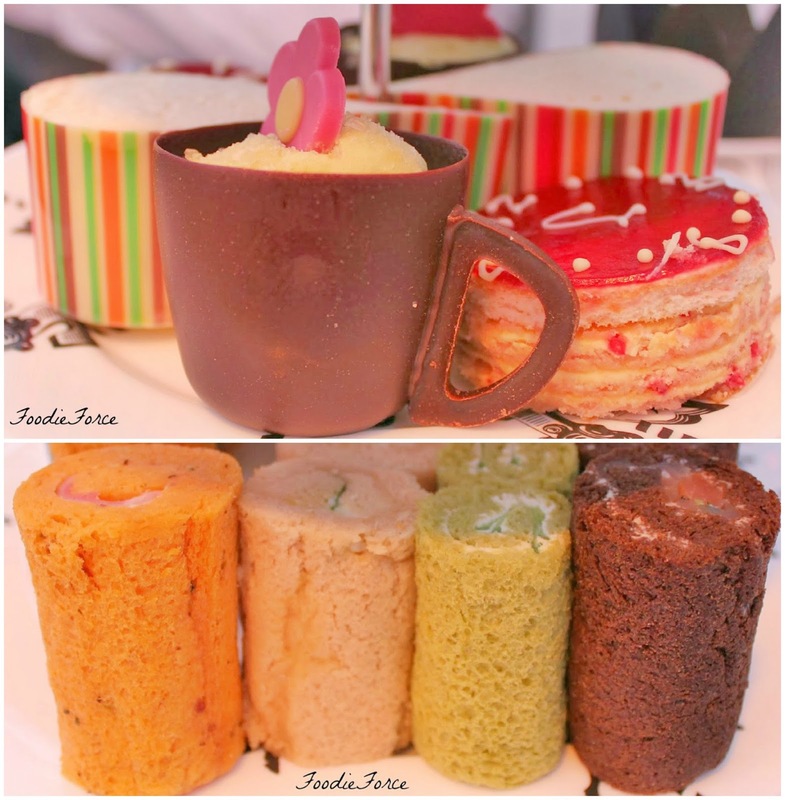 For me the quality of the afternoon tea and service are all very well and good, but so too is where it’s served. 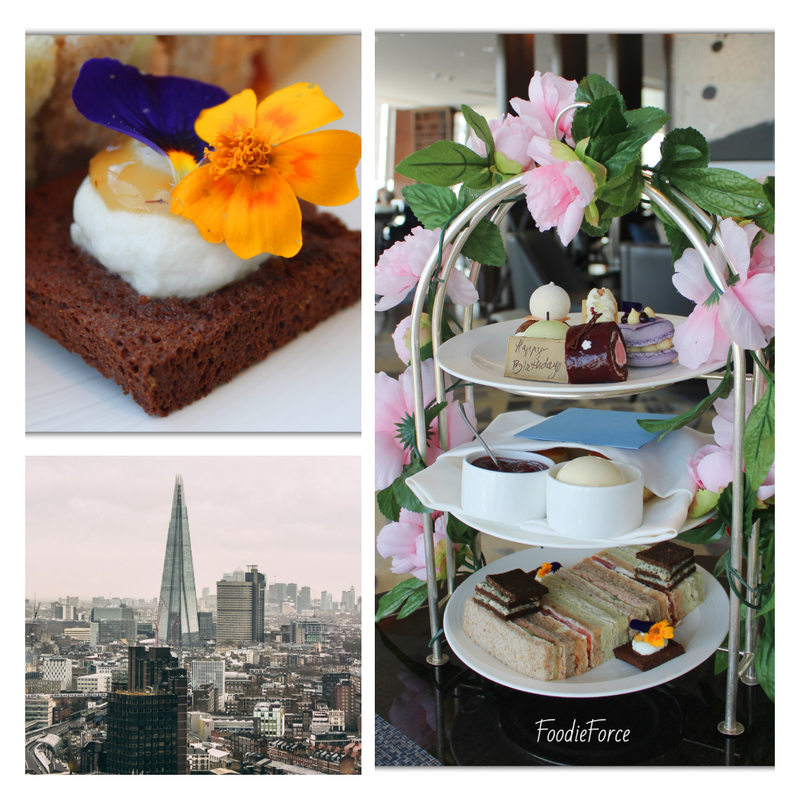 London offers some of the most quintessential English afternoon teas but a highlight of them all for me has to be Ting Shanghai-La Hotel at the Shard. Set on the 35th floor, with ceiling to floor windows you are provided with a breathtaking view over London. 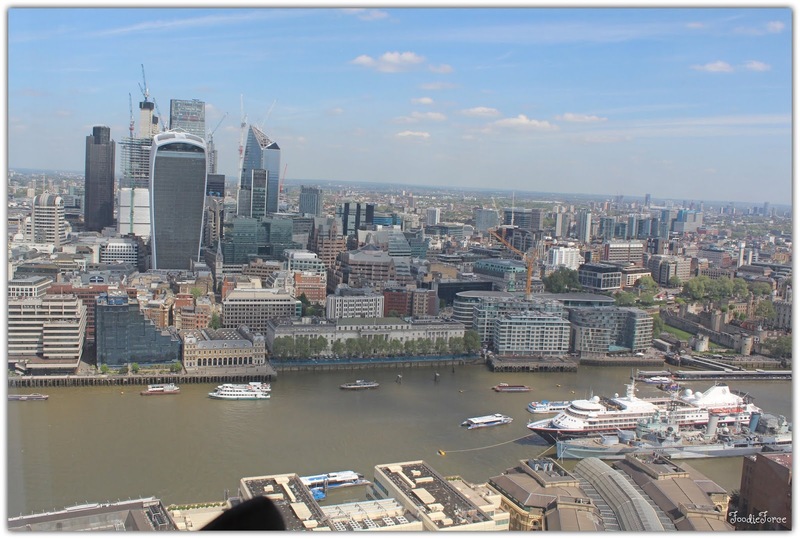 We were lucky to be seated directly above Tower Bridge and the HMS Belfast. To celebrate the Royal wedding of Prince Harry and Meghan Markle, the hotel had created the Royal Botanical Afternoon Tea. The tea was based around the flowers grown in the royal garden. As we sunk into the comfortable deep seats, we began our afternoon tea with a lovely glass of zesty, crisp Bollinger, La Grande Année, 2007. Whilst the sun raged outside we happily sat chatting in the air conditioned surroundings, sipping our chilled champagne and looking out at the spectacular view of London, a view which even now I still never tire. Champagne was followed with a theatrical presentation of Calamansi tea, served over dry ice. The tea was provided to cleanse the palate and reminded me of lemon sherbet. We thoroughly enjoyed the theatrical show of smoke billowing across the table. The presentation of the tea is definitely one of the more interesting ways to begin an afternoon tea. Ting offers an extensive tea selection and whilst staff are happy to guide you, I opted for Rose bud, a favourite with a wonderful floral aroma and a delicate rose flavour. But let me get on with the main event as I am sure most of you are interested to know what came next. The savouries offered some of the usual suspects, hot smoked salmon with cucumber and juniper cream. Myrtle, roasted chicken, mustard and Tarragon. Heritage tomato, lemon, ricotta and walnut. My favourite offering had to be the Bermondsey honey, goat's curd and lavender rye, not only beautiful presented but delicious too. Unfortunately the same could not be said for the Dorset crab, seaweed mayonnaise and pumpernickel. Whilst the individual ingredients were delicious the rye bread and the many layers of it simply made it too dry. The bread overpowered the ingredients of the sandwich. Next up we were served warm scones, with strawberry jam and clotted cream. The delivery of scones is something very much for me that can make or break the success of an afternoon tea. But I'm pleased to report that the English plain and raisin scones both lived up to my high expectations, lite and fluffy. Make sure though you save room for the sweets which truly are a work of art. Almost too good to eat! My personal favourite had to be the apple tart with caramelised apple and Elderflower. The shortbread pastry had a wonderful buttery taste and the creaminess of the apple a real delight. 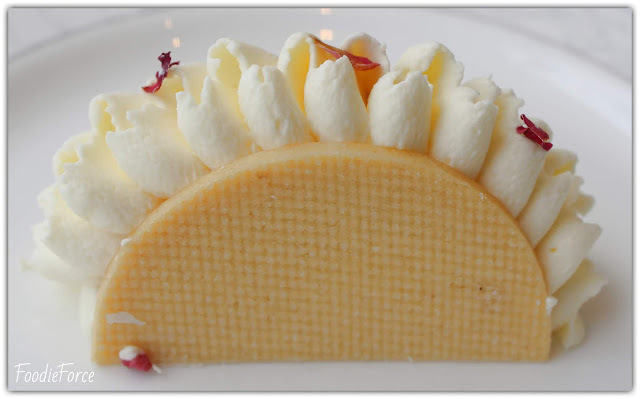 Raspberry rose: lychee mousse, raspberry confit with rose. The delicate taste of raspberry with the rose was lovely and refreshing. Cassis violet macaron, blackcurrant confiture and violet creme. For me this was too sweet, but I think this was more to do with what had gone before. If you weren't as greedy as me and ate it as a stand alone, I think I might have felt differently. Cherry blossom roulade, chocolate vanilla and sour cherry. A perfect sized dessert, in which I enjoyed the tartness of the chocolate balanced against the sourness of cherry. Milk chocolate religieuse, Earl Grey tea and grapefruit compote. Wow this was an amazing dessert with so many of my favourite flavours. The waiting staff never once rushed us, which I loved. The staff were attentive, with great knowledge of the available teas and treated each tea as something to savour. We whiled away a wonderful afternoon. Ting restaurant is definitely a perfect setting for a relaxed afternoon tea, with views to set it apart from other locations we have experienced. After over filling our bellies how we wished we could snuggle up in the hotels wonderful rooms and slumber for a few hours. We will most certainly be back. Everyone's skin type is different so finding a face mask to perfect your skincare routine can be a challenge. It's taken me many years to understand that I have combination skin, my skin is mainly dry with my T zone (nose, forehead and chin) being slightly more oily. It's also prone to being sensitive. As a busy mum, face masks for me are a quick and easy way to pep up my skin. 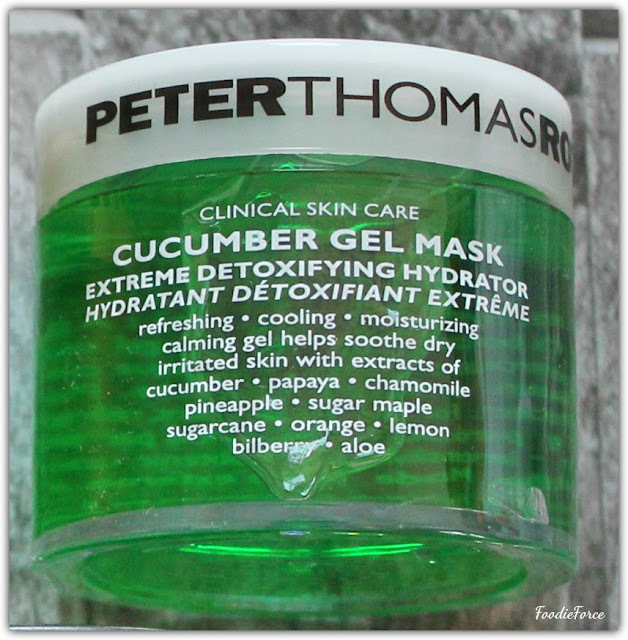 The Peter Thomas Roth Mask-A-Holic face masks (£72), a collection of five 150ml full sized pots in one collection represents real value for money. Blue Marine Algae (£34):This was the mask I was most looking forward to using, mainly as it states it has intensely hydrating properties, so perfect for my dry skin. Applying to the skin it is clear and has a gel like consistency which was cooling. After a while the gel tingles and gives a warming sensation on the skin. If you have sensitive skin then this face mask might not be for you. I personally didn't really like the sticky wet feeling that the Algae had and I saw absolutely no difference in the moisture of my skin post application. It's for this reason that I wouldn't repurchase. 24K Gold Mask (£48): Probably the most intriguing and luxurious of the five masks with pure 24K gold and colloidal gold. The product looks incredibly pretty both in the pot and when applied to the skin as it gives off a wonderful shimmer. It claims to tighten the skin, lifting, firming and brightening. I can't say that my face felt lifted or firmer but it did have a smoother appearance and was refreshing. Cucumber Gel Mask (£28):My skin can sometimes get flushed and irritated, this cooling and hydrating face mask is perfect for refreshing the skin. With cucumber, aloe vera, papaya, pineapple and chamomile it has lots of soothing ingredients. I keep this face mask in the fridge so it is wonderful and cold, when applied the gel doesn't sting which makes it perfect for sensitive skin and can even be placed under the eyes. I can't say I saw any major changes in the hydration of my skin after use but I am sure it will be loved in the Summer months to sooth and calm a sun kissed face. Pumpkin Enzyme Mask(£42):The first thing that you notice on opening the face mask is the smell of pumpkin spice, definitely reminiscent of Christmas. Applying the face mask you instantly notice that it has a thicker grainier consistency, you can feel it working with a tingly sensation. I have to point out at this point if you have really sensitive skin, I am not sure this is the mask for you. I personally had no problems, but it is an exfoliate so slightly stronger and will easily remove dead skin. I really loved this face mask as it evened out my complexion and my skin felt smoother. It can be quite a stripping face mask so I will use this once a month to pick my skin up. Irish Moor Mud: Unless you have been living under a rock I am sure you are all aware of the major hype there has been in the last couple of months about charcoal activated face masks. I don't know about you, but I have been taking serious pleasure in watching people on YouTube making their eyes water, pealing them off to reveal loads of rubbish and tons of blackheads. The consistency and texture of this face mask is different, it is smooth to apply remains fairly translucent and does not dry. The product has very little smell and definitely not anything reminiscent of a moor. I did find that it was slightly tingly, but I personally like this as it feels like it is doing something. This was the only mask out of the five, that I found value in the removal tool. The tool was nifty at removing stubborn parts around the nose, eyes and hairline. This mask was by far my favourite out of the five, on removal my skin instantly looked refreshed and has worked well to remove spots around my T-zone. Overall the box set represents great value for money and a wonderful way to try many of the Perter Thomas Roth face masks. Out of the five I will only most likely repurchase the pumpkin enzyme mask and Irish moor mud, both of which over longer usage have done wonders for bringing a tired mothers skin back to life with little investment and time on my behalf. Since purchasing this box set, Peter Thomas Roth has released a smaller sample size with six travel versions (£24) which you can find here. Each tube has between two/three applications a perfect way to try them out. Have you tried any Peter Thomas Roth products? What are your skin care recommendations and tips? Share in the comments below. Life over the last couple of months has been really busy with so much going on. This has meant more and more of my time is spoken for, between caring for Noah, a busy job, commuting and a rather manic life I can sometimes feel overwhelmed. I never really have a moment anymore just to be me and relax. In my twenties I thought nothing about sitting reading a book for a whole day. Exercise was a frequent activity and a past time I enjoyed. I loved going for long walks and enjoying the outdoors. I could regularly be found relaxing in a deep bath with a pampering face mask. If I have a moment now I'm riddled with guilt that I should be doing something else. I can be found doing two or three things at once on a regular basis, which means I often feel flustered that I’m not doing a good enough job in any area of my life. We live in a world and society that is constantly striving for perfection, encouraging us to do more and more as well as wanting everything done now. This can often lead to us overworking every area of our lives, but if we had more balance could we be more productive and happier. “Am I applying my time and energies in the right places, to be my true happy self?”. "How do I take time for myself". So I've been looking at how long I spend time on different areas of my life, looking at what I spend most of my time doing and how I can reduce the time I spend on some tasks to have more time for myself. Everyday I have been setting aside ten minutes to meditate, which has been a wonderful way at making me stop, take time for myself and bring about a sense of greater calmness. It has also helped to root me in the here and now. So I thought I would share some apps that I have been loving. 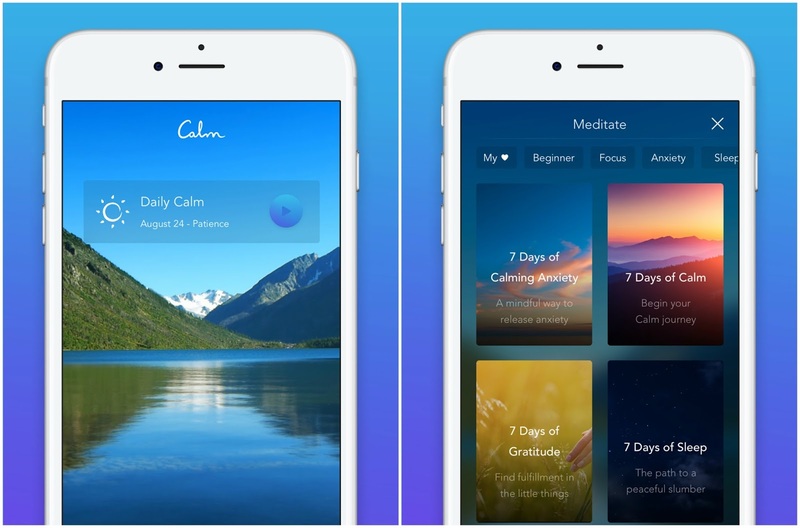 Calm: The app is free to download and has some great content that you don’t have to pay for but a paid subscription of £35.99 a year, gives you over a 100 hours of brilliant content which is constantly added too. I use the beginning journey to calm which is a great introduction to mediation with a seven day session. 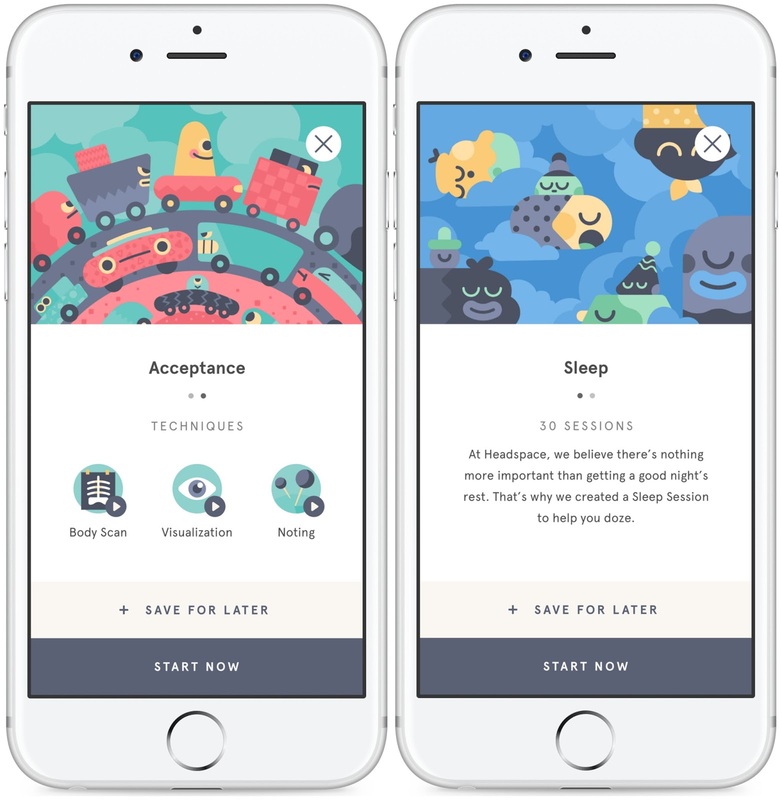 The perfect place to start with focused sessions to relieve anxiety, overcome stress and the app also has wonderful sleep stories to send you off into deep slumber. Headspace: I have been using this app for over a year now and love it. 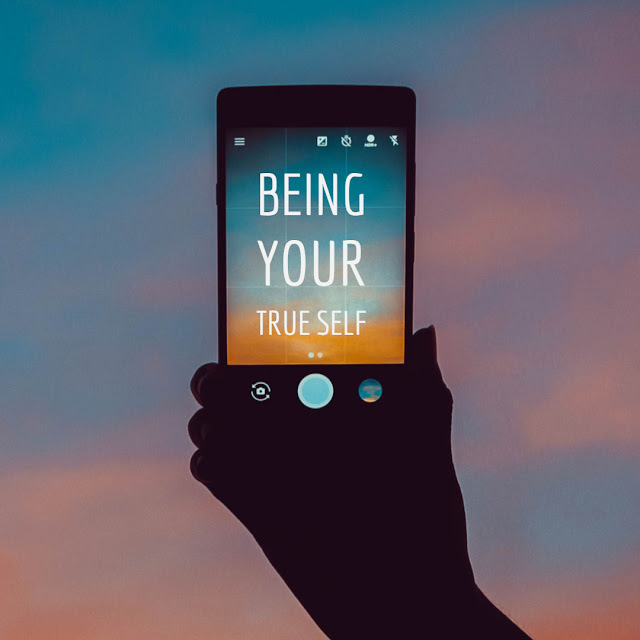 It is easy to navigate, with defined timings of 5,10,15 and 20 minutes to meditate, so even those with the least amount of time have no excuses. It offers short and easy to do sessions, which have helped to alleviate stress and sleep problems. If you love the app and want to have access to all the content then a yearly subscription of £74.99 is needed. Rituals have a wonderful free app with guided meditation for three areas: relaxing the mind, relaxing the body and enjoying the moment. In which you can do 5, 10, 15 or 20 minutes of meditation. They also have a guided yoga follow along too. I've personally have found the benefits of meditation to be huge. Do you meditate? How do you relax? Share in the comments below. Know someone that could benefit from this post please do share. If you want to get away from the world, relax and recharge your batteries the Sanderson Hotel London has to be experienced. For those of you who have been following for a while, you will know we love the Sanderson Hotel especially their Mad Hatter's afternoon tea. If you haven't been I definitely recommend it. Since having Noah (over two years ago) me and the other half haven't had a date night, so we decided to have a date day instead. 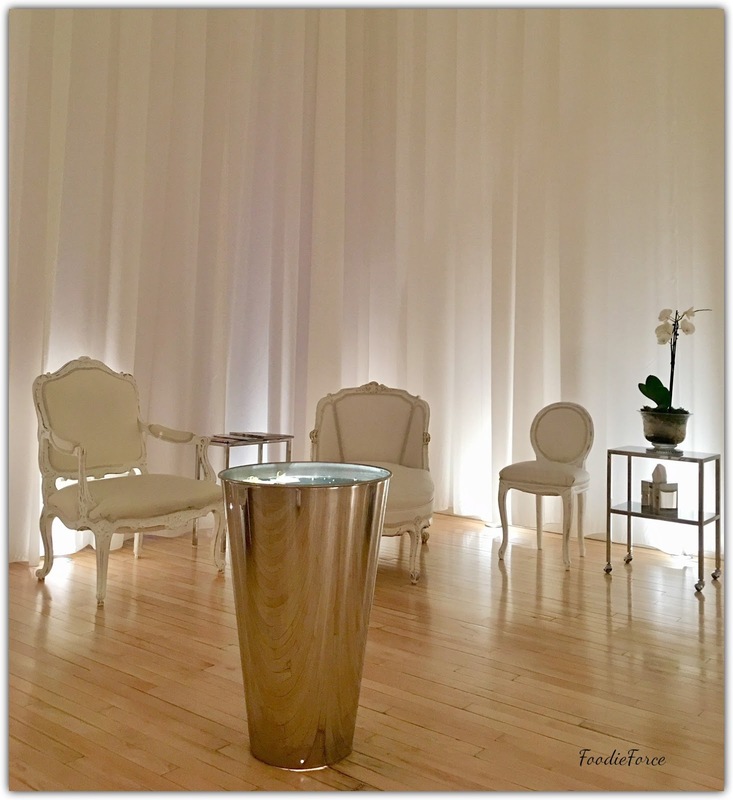 So on a recent day off we decided that a visit to the Agua Spa at the Sanderson hotel was very much needed. 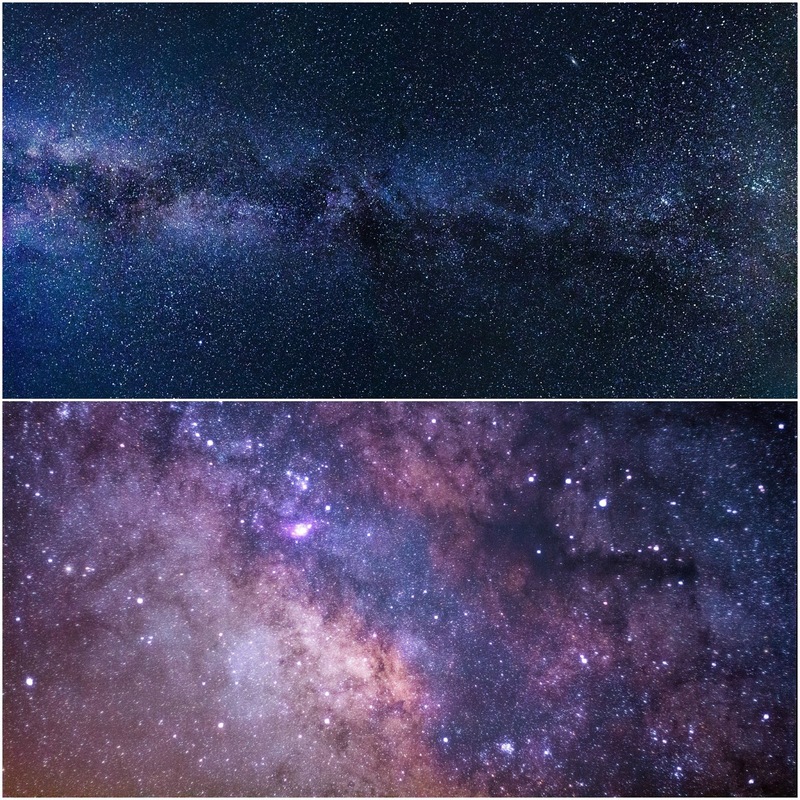 To get to the spa, you are transported via a lift decorated with images of space and stars imprinted on the walls. On entering the spa, you instantly relax with softly spoken staff, candles, floor to ceiling drapes which all add to a dream like and serene ambience. The friendly staff show us to the beautifully designed changing area with large mirrors and beauty desks. I started with a relaxing sit in the female only steam room to clear the airways, followed by a nice shower. 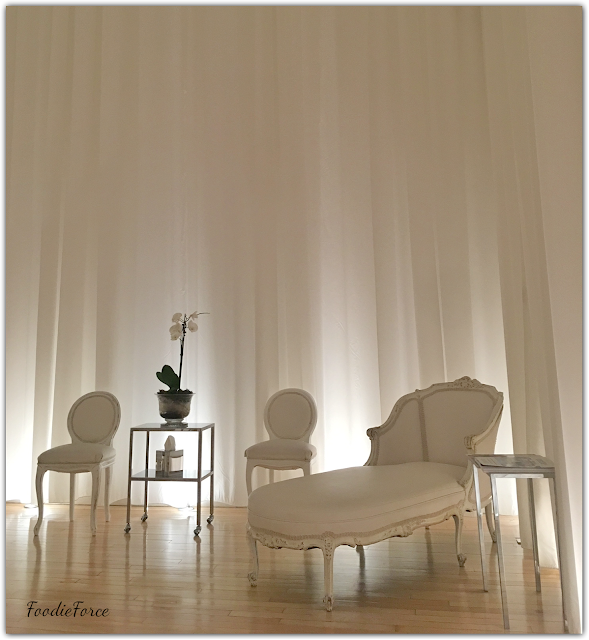 Hidden away amongst the drapes, the spa offers private areas containing pods to melt into and relax. The pods which are small armchair beds, for me offered the best relaxation where you could snuggle up under a Goose feather duvet for hours. They were so comfortable, I thought I was in heaven. Whilst in the pods you can enjoy a yummy smoothie of blackberry, strawberry and raspberry or choose something else from the food and drink menu. The spa offers a range of massages, body treatments, manicures and pedicures. We opted for a couples soothing Swedish massage. Matt who did mine definitely has to be one of the best masseuses I have experienced. His fingers worked like magic to unwind and remove the knots from a tightly coiled back. I seriously felt like a new woman after my massage, it helped to relieve my stress and I definitely felt re-energised. The benefits lasted for a good week afterwards. So all in all a wonderful day. If your looking for a spa to unwind from the busyness of modern life, the Sanderson spa and hotel offers the perfect place to relax. Do you have any other spa recommendations for us? Share them in the comments below. What on earth is up with the weather? At this moment London is absolutely freezing, I personally will be so glad when the weather starts to warm up. 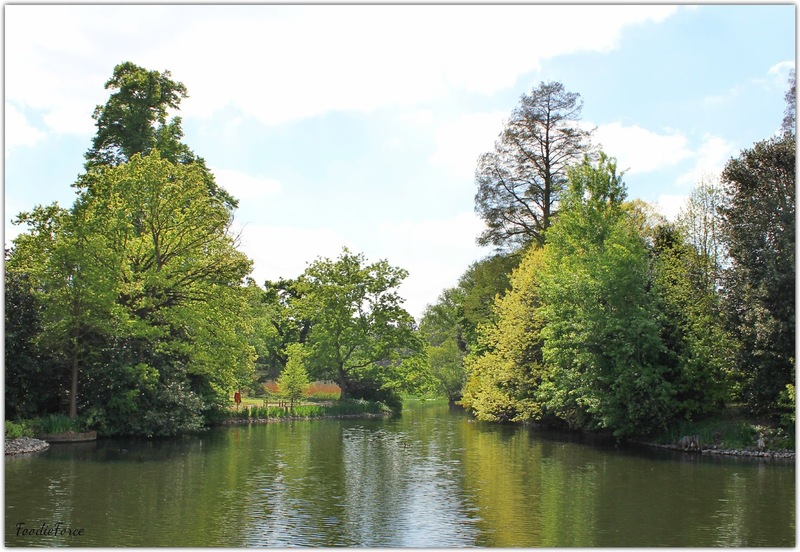 So to cheer us all up I thought I would share a recent visit we made to Kew Gardens, when the weather was much nicer. You know your getting older when you get excited by the prospect of visiting a garden for a day out. The Royal Botanic gardens, Kew might just be the exception; thirty minutes outside of London in Richmond it has something for all ages. 1. 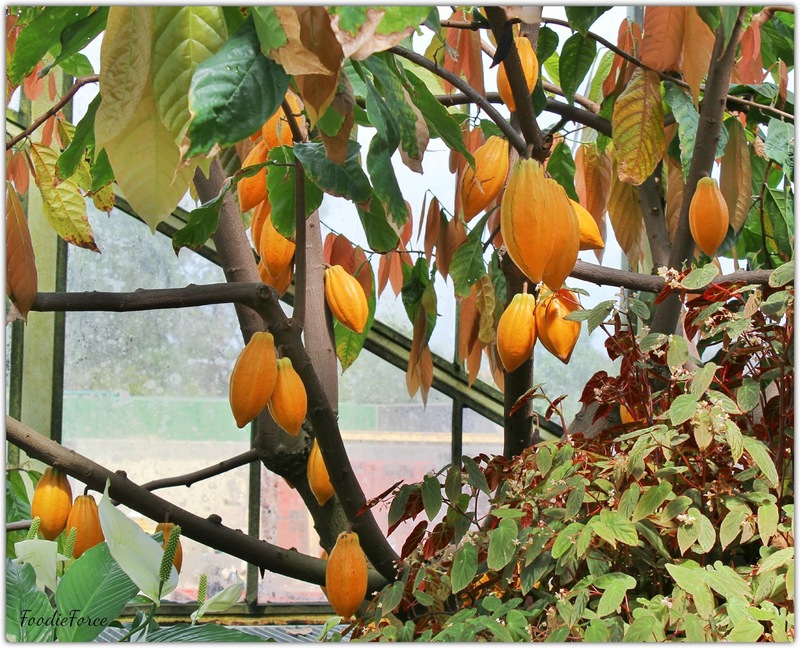 Palm House: A Victorian Glasshouse with a rainforest climate that houses spectacular canopy palms. 2. Welcome to the tropics, the Prince of Wales Conservatory houses beautiful orchids, an amazing cactus collection and ferns. 3. The Hive is a new installation created by artist Wolfgang Buttress, as a celebration to the importance of honeybees. At least one third of our global crops are dependent on honeybees as pollinators. At 17 metres high the Hive is a vast honey bee hive. A thousand lights flicker in time to the vibrations of the bees and sounds linked to a real hive in Kew Gardens, its a sight to behold. Noah was absolutely memorised by the sounds, glass flooring and lights. 4. Walk tall amongst the trees, set 18 metres off the woodland floor the TreeTop walkway is a great way to get a top down view over Kew. If your eagled eyed you might even spot some beautiful birds high in the canopies. 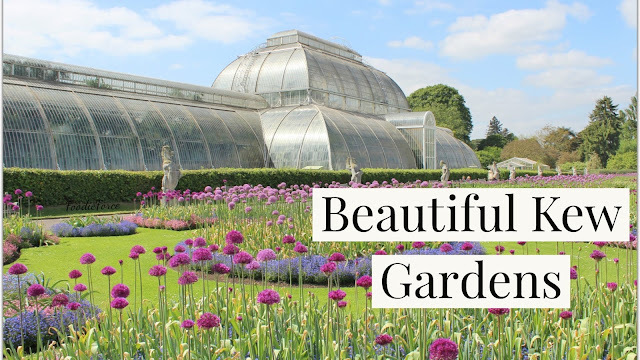 So when the weather warms up in a few weeks, head over to Kew Gardens for a great day out. Make sure you leave enough time for tea and scones at the cafe though.